Snippets of Jack: "I'd vote for you"
Right side up and sailing along, all nice and calm, Jack Sparrow and Barbossa just have to disturb the peace because they can't decide who gets to be head Captain of the Black Pearl. Barbossa: "What are you doing? "Jack: "What are you doing?" Barbossa: "No, what are you doing? "Jack: "What are you doing?" Barbossa:"No, what are you doing? "Jack: "What are you doing…er, captain gives orders on the ship. "Barbossa: "The captain of this ship is giving orders. "Jack: "My ship, makes me captain! "Barbossa:"They be my charts. "Jack: "Well, that makes you…chart man!" Wow guys, real mature. Well one of the silly pirates Decides to weigh in with his two cents, Pintel: "Stow it! Both of you! That's an order! Understand? [Jack and Barbossa stare at him] Sorry. I just thought with the Captain issue in doubt, I'd throw my name in for consideration, sorry." Ragetti: "[to Pintel] I'd vote for you." Well to be honest I would vote for him too. Hahaha NOT! We never really find out who is really in charge. But soon after that immature argument, the crew returns to whatever crews do on large ships. After sailing for a short time, half the crew they acquired turns on them and Sao Feng pops in and captures their ship and takes the crew (along with the disagreeing captains) captive. And guess who else pops in? Our favorite short dude, Lord Cutler Beckett, We'll get back to him in a bit. It turns out After getting his hideout blown to pieces by the EITC Sao Feng decided to join them. (Quite an odd move if you ask me) He tries to explain his reasoning to Barbossa, "There is no honor in remaining with the losing side, leaving it for the winning side…that's just good business." "The losing' side, ye say?" But Barbossa who still has faith in his fellow pirate tries to convince Feng to break his deal with the EITC and come to the gathering of the Brethren Court, he has a trick up his sleeve and tries use it to lure Feng back. Meanwhile Jack and Beckett are having a discussion, in which Beckett tries to convince Jack to lead him to Shipwreck Cove (meeting place of the Brethren Court) , While also threatening him with a teeny-tiny little pistol, Jack who is apparently is still mad at his rescuers ( or maybe his was afraid of the pistol? ) agrees to the deal, as long as Beckett forces Jones to stop chasing him. 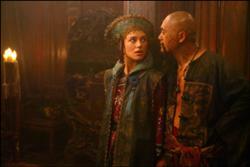 Back to Barbossa and Feng, Elizabeth is bartered off in trade for Feng's loyalty to the pirates. To show his loyalty Feng attacks the EITC ship Endeavor while Jack is still on board. Jack has to duel with Beckett's friend Mercer, but eventually escapes back to his ship the Black Pearl. And Lizzie sets off with Feng, on an uncertain mission. Soon she finds out that Feng thinks she is the human form of Calypso (goddess of the sea trapped by the brethren court many years ago) However, the EITC wasn't happy that Feng betrayed them so they sent Jones and his ship The Flying Dutchman after them. Being the savvy pirates that they are, The crew bombards Sao's ship The Empress with cannon balls. on of them hits the captain's cabin where Sao happens to be trying to force his plan upon Elizabeth. The cannon ball barreled through the wall and sends shards of wood into Feng's back, impaling him. Just before he dies Sao names Elizabeth as the captain. And The Empress continued on to the gathering at Shipwreck Cove. Where argument and gunfights await them. But hey they're pirates what do you expect?